Another take on poetry and politics, or more specifically how to feel useful and engaged in a ‘time of crisis’ , can be found here. I can relate to some of this article, but can’t help thinking that a lot of people were living in times of ‘crisis’ before the results of elections in the US shook up their world view. Don’t get me wrong. I am not complacent or immune to anxiety over recent developments. I’ve had recurring nightmares about Nazis which I imagine came about after hearing of the rise of white supremacists and their increased profile and apparent proximity to power in Europe and the United States. I worry about climate change and its denial. However, it is simplistic to think that all was well yesterday and that everything has suddenly changed for the worse. Many people live under threat because of their gender, religion or race, or because of lack of access to basic sanitation and healthcare. The richest countries supply the arms that fuel conflicts in which civilians suffer. This is a huge area for philosophical debate and if I recommend visiting this site and particularly the comments section, if you are interested in the discussion and interpretation of this statement. Another definition might be that politics is about who gets what, when and why. There are thousands of overtly political poems, poems that addresses issues or situations by name, that are powerful and memorable. A poem like Neruda’s ‘I’m explaining a few things’ which he wrote in response to the bombing of Guernica in the Spanish Civil war, bears witness to an inhumane act. It contrasts many aspects of the complex and simple beauty of the city’s daily life prior to the atrocity with the destruction and suffering in the aftermath of the bombing. It is a timeless piece that serves as a monument, and sadly, remains relevant as an expression of disgust and horror. Neruda is a great poet and was able, I think, to write a worthy response to this event. Not all poets can achieve this. Political poems can lack subtlety. They might read as ‘preachy’, or appear to tell the reader what to think. The same is true, for example of songs. Although John Lennon wrote some great ones, his “Power to the People” is not one of them. Perhaps at the other end of the scale is ” Strange Fruit“, first recorded by the great Billie Holiday in the late nineteen thirties. The lyrics were originally a poem, written by American writer, teacher and songwriter Abel Meerpol. Meeropol had seen a photograph of the lynching of Thomas Shipp and Abram Smith in Indiana, and wrote his poem, which he later set to music, to express his horror. The heading of this post is ‘politics, poetry’ and I’m aware I’m rambling a bit. Perhaps a consideration of the interaction of these two subjects would be better suited to a thesis or two. Definitions of the ‘political’ can extend into every aspect of human life. Accusations of poetry’s failure to respond to the ‘political’ seem to discount the recent increase in the diversity of voices being heard in British and American poetry- voices that arise from a wider range of gender and racial perspectives than previously heard; voices that articulate a wider range of experience. As a contemporary writer it is possible to wonder if one is responding ‘well enough’ to political events. To feel that one is somehow failing to articulate responses to disturbing events. 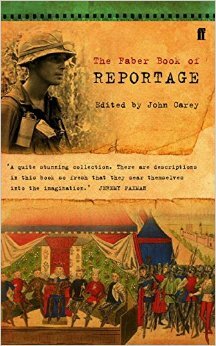 I recently picked up a second-hand copy of The Faber book of Reportage. I might need reminding ) that barbarism on a huge scale is as old as the human race. This ongoing inhumanity has never prevented the celebration of its beauty in art. We have Neruda’s civil war poem, and we also have his love poems. We have Picasso’s ‘Guernica’. We also have his ‘Child with dove’. I suppose I am trying to articulate the rather obvious idea that not every artist can respond to ‘political’ events by producing ‘political’ art. However, I believe it is important for writers and artists of all kinds to respond to inhumanity and humanity on whatever scale they can, and by exploring their daily lives, to add, if they have the freedom and means to do so, their unique voice to the ongoing record of human experience. Carl Philips articulates this far better than I can. Here he is again. There are lots of resources related to this massive topic here. I’d welcome any thoughts. Thank you. Thanks Roy, for a thought-provoking post with lots of links to follow up. As a political person (with a small p) I find it impossible to write other than about the things that concern me, anger me, upset me, both domestically, nationally and globally. I find that the big problem is, as you point out, to avoid preaching and proselytising when writing about issues that deeply concern me. It is often difficult to ‘show not tell’ as both my fine art and creative writing tutors have said so often! ‘Tell me lies about Vietnam’ and how important it was as a simple expression of anger . I think telling is sometimes essential.